Solar activity is very low. Nevertheless, space weather continues. High above late-summer thunderstorms in Africa, red sprites are dancing across the cloudtops, reaching up to the edge of space itself. Astronauts onboard the International Space Station photographed this specimen (circled) on March 14th. Sprites are an exotic form of “upward lightning.” They are a true space weather phenomenon, inhabiting the upper reaches of Earth’s atmosphere alongside meteors, and some auroras. 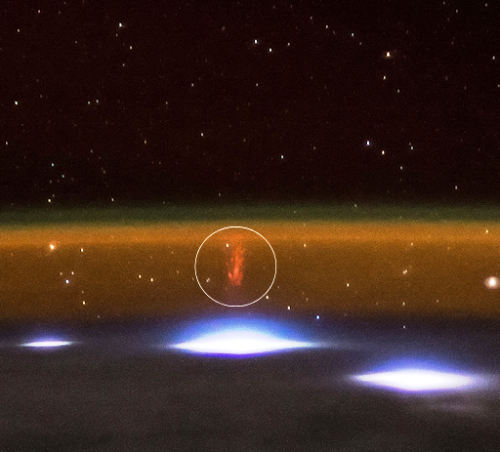 Some researchers believe sprites are linked to cosmic rays: subatomic particles from deep space striking the top of Earth’s atmosphere produce secondary electrons that, in turn, could provide the spark that triggers the elaborate red forms. Although sprites have been seen for at least a century, most scientists did not believe they existed until after 1989 when sprites were photographed by cameras onboard the space shuttle. They have since been photographed many times from the ISS.